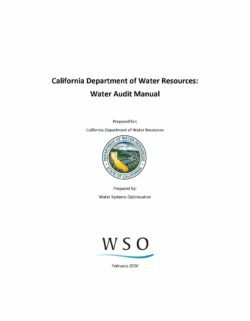 This document is intended to provide guidance on preparing a distribution system water loss audit in accordance with the American Water Works Association (AWWA) Manual 36. The guidance was prepared specifically as a reference for California water suppliers. To improve water loss reporting in California, SB 1420 (2014) was passed requiring water suppliers to submit water loss audits as part of urban water management plans prepared once every five years. SB 555 (2015) builds on SB 1420 and requires, beginning in 2017, the submittal of annual water loss reports to the California Department of Water Resources (DWR) that have been validated for data accuracy. This guide should be helpful, but is not intended to be a substitute for the AWWAs Manual 36. Water loss audits are a valuable tool in identifying and prioritizing distribution system leaks that when addressed can improve the efficiency of water production and delivery for all water suppliers by reducing losses.